"Sonic 1" redirects here. For the 8-bit version, see Sonic the Hedgehog (8-bit). For the remake, see Sonic the Hedgehog (2013 game). For similarly titled media, see Sonic the Hedgehog (disambiguation). Sonic the Hedgehog (Japanese: ソニック・ザ・ヘッジホッグ) is the first game in the long-running series by video game publisher and former console maker Sega. First released in the United States and Europe on June 23rd, 1991, it was the premier outing for the character of Sonic the Hedgehog and the group behind his creation, Sonic Team. Though the game only received marginal success in its home country, almost overnight Sonic became a sensation in the West, solidifying Sega's place in Europe and turning the company into a household name in the United States. For the first time, a company was able to directly compete with console and gamemaker Nintendo, which had dominated the second half of the 1980s. Though Nintendo still reigned supreme in Japan, the highly-contested 16-bit war in the West was a marvel to behold, the big two being neck and neck through almost the entirety of the third generation of console gaming. The game propelled the creators into the realm of video game superstardom, programmer Yuji Naka for a time becoming the face of Sega much as Shigeru Miyamoto became the face of Nintendo after the success of Super Mario Bros. The franchise took off, with a version of the game being released on the Sega Master System and a series of sequels across Sega's various consoles over the years. It not only became the definitive title for the system and replaced Altered Beast as the pack-in title for the West, but would go on to be ported to no less than twenty platforms after its initial release. Somewhere in the ocean lies a mysterious island not found on any map, known by its inhabitants as South Island. The reason for it being absent is a simple, yet mysterious one: it does not have a fixed position, instead traveling through the seas on its own course. While the reason for this behavior is unknown, it is rumored that it may have something to do with the legendary gemstones known as the Chaos Emeralds. Though legend says they exist on the island, no one knows exactly where they are or how to get a hold of them. All they do know is of the incredible power they are said to contain, and how they can give energy to all living beings. Learning of the existence of the Chaos Emeralds, the mad genius Dr. Eggman sets himself on a quest to locate the emeralds for his own use, wanting to harness their power for his many mechanical creations. With the plan in motion, Eggman creates his base in a corner of the island, which he dubs the Scrap Brain Zone. However, he is aware that his evil plans will more than likely be interfered by Sonic the Hedgehog. Though not a native of the island, Sonic the Hedgehog would often find himself on its mystical shores, and more than once had he run into the evil doctor, foiling an untold number of schemes. Just as Eggman predicted, in no time at all does the blue hedgehog learn of the doctor's intentions, running at sonic speed to confront him. It doesn't take long for Sonic to realize that something is amiss, and is shocked to learn that Eggman has gone a step further with his evil intentions. Kidnapping the many animals living on the island, he has methodically been placing them in robot shells and using them to scour the island in search of the emeralds. Realizing that Eggman has turned Sonic's friends into his own personal mechanical army, Sonic wastes no time. Running across the island, he must not only stop Eggman's latest scheme and gather the Chaos Emeralds, but free his friends in the process. "Hurry! Sonic the Hedgehog - everyone is waiting for your help!" Sonic the Hedgehog facing off against his arch-rival, Dr. Eggman. At its heart, Sonic the Hedgehog is a platformer. Taken from the same mold as platformers previous, Sonic Team was able to make the experience unique enough to rise it above the numerous Mario clones that had flooded the market. Becoming the standard for the Mega Drive, the game was also developed to showcase the potential of the system, creating a smooth-running and fast-moving game that is simple to pick up but complex and engaging underneath. Broken up into six "Zones" with three "Acts" each (plus a "Final Zone" at the end, a single Act consisting of a final boss confrontation), the game operates under a very basic platforming premise: to traverse across each of these Acts under a certain amount of time (in this case ten minutes) and overcome whatever enemies and obstacles may be in your way. The flow of each of these Zones presents an interesting duality in terms of playthrough. While it is possible to go through each act slow and methodically, it is just as simple to run through the Zone as fast as possible, playing for the shortest time as opposed to the highest score. Featuring multiple pathways and plenty of secret areas, the eighteen main courses were created specifically with replayability in mind, with game director Hirokazu Yasuhara wanting a game that could stand the test of time, something more than a basic arcade experience. Thanks to the efforts of Yuji Naka, the engine by which Sonic the Hedgehog is powered focuses not only on the potential speed for the character, but establishes the physics for the world as well. Being one part "pinball" and one part "momentum", the movement of Sonic depends just as much on the unique terrain of each level as it does on the input of the player. When it comes to the now-iconic set pieces of loop-de-loops and curved slopes, Sonic can only run through them if he has built up enough momentum to traverse through it. Running on curved slopes, a player can press downward on the control pad, allowing Sonic to curl up into a ball and gain tremendous speed - the steeper the slope, the higher the max speed at the end. Even the angles for which Sonic bounces off bumpers and springs are determined by the values within, making the Sonic experience unique from what other games were presenting at the time. Sonic the Hedgehog rolling downward in Spring Yard Zone. In terms of the moveset, the original Sonic the Hedgehog chooses to keep it simple. A secondary button is not needed to increase Sonic's speed, only time. Each of the three buttons on the Mega Drive controller were mapped to the same action, giving the player the power to make Sonic jump up, curling into a ball in the process. With this spin attack, Sonic can break an enemy from any angle, provided a spiked surface or a fire projectile is not in the way. He can also curl into this ball from on the ground, but can only remain as long as there is some momentum behind it. Once Sonic slows down, he is forced to return to his standing (or crouching) pose. Scattered throughout each level are also a variety of items, the most famous of these being the spinning golden rings. While collecting 100 of these will award Sonic with an extra life, they serve a much more important function: as long as Sonic has at least one in his possession, he can not be killed by an enemy or spikes, though he can still succumb to crushing or drowning. Being hit while having rings causes them to scatter, making Sonic temporarily invincible to give the player time to recover and try to collect the scattered rings before they disappear. Another prominent item featured in each Zone are the variety of item boxes. Resembling computer monitors, each give Sonic a different reward depending on the image inside. If a ring is pictured, for instance, the player gets an extra 10 rings added to their ring count. If the icon is a group of stars, Sonic is awarded with temporary invincibility. A shoe icon allows the character to temporarily run even faster than what can normally be achieved, and a shield icon gives Sonic a barrier that will protect him from a hit, either maintaining his ring count or not killing the player if no rings are available. Another common item found on the playfield are Lamp Posts, allowing Sonic to start at that point in the level in the case of the player losing a life, as opposed to starting the act from the beginning again. These, along with other level features such as springs, spikes, and bumpers, create a landscape that would be featured again and again within the Sonic the Hedgehog series. Dr. Eggman taunting the player when you complete the game without all six Chaos Emeralds. At the end of the first two Acts in each Zone, a Signpost with Eggman's face is there to greet you, as you run by it and turn it to Sonic's profile signaling your victory. However, at the end of each third Act, the player is greeted with an appearance from the main antagonist in his Eggmobile hovercraft, modified to present the player with a new challenge, with each Zone. Needing eight hits to be defeated, the doctor scurries away, allowing Sonic to open the animal capsule and free his friends, signaling the end of that particular Zone. Though entirely optional in a standard runthrough of the game, there is another element to the Sonic the Hedgehog gameplay experience. With the exception of the Scrap Brain Zone, at the end of the first two Acts of each Zone, a Giant Ring will appear to the right of the ending Signpost if a player is able to complete the Act with at least 50 rings. Floating silently just as the standard rings do, if Sonic jumps into the ring in time, he will be transported to the Special Stage, a maze rotating 360 degrees. If traversed correctly, the player will be rewarded with a Chaos Emerald. Collecting all six emeralds is the only way to witness the true ending to the game. Failing to do so, Eggman will taunt the player at the end, juggling the missing emeralds, asking you to "try again". End-of-level flags: Where the Signpost stands, there are sometimes flags you can trigger. These flags are hidden, but if you hit them they will appear and show either 100, 1000, or 10000. The flags that say "100" are really only worth 10 points each, but the 1000 and 10000 flags report their values accurately. Utilizing the onboard Zilog Z80 microprocessor, Yamaha YM2612 synthesizer and Texas Instruments SN76489 PSG sound chips, Sonic the Hedgehog was able to create a sound that was also unique, with the jumps, springs, and ring collecting sounds being an intergral part of the Sonic experience. These audio effects created by the sound team would be reused in subsequent entries, the classic ring sound still being heard with each new Sonic game. The music to the game, composed by Dreams Come True artist Masato Nakamura, also became a highly praised game soundtrack. Instead of treating it as a video game, Nakamura went into the project with the same mindset he would have if he were to compose the music to a feature length film. 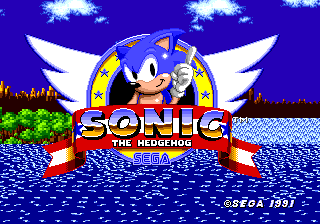 The first two songs written, the Green Hill Zone theme and the title screen jingle, would be alluded to in subsequent games, becoming the quintessential score of Sonic the Hedgehog. The popularity of the soundtrack has also made it a standard in live videogame music performance tours such as Video Games Live and Play! A Video Game Symphony. The level select to Sonic the Hedgehog, also containing the sound test. 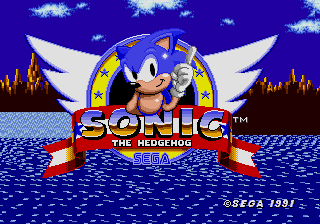 The graphical style of Sonic the Hedgehog was extremely impressive for its time, especially for the Mega Drive hardware (the Super Nintendo being technically superior in terms of graphic capabilities). With a color pallette expanded beyond what 8-bit systems could do, each zone was given a unique and rich look. The graphical style was inspired by the then-new world of "computer generated" graphics, the visuals of the Green Hill Zone being the most prime example. Even the sprites of Sonic, Eggman, the enemies, and the rings reflected on this, each richly animated object jumping out of the screen. While other games of the era can look dated, Sonic the Hedgehog has been able to maintain a timeless feel, emphasized by the visual work of Naoto Ohshima and the fact that the original game still sells, albeit on modern hardware. 15,000,000 Sega Mega Drive Sonic the Hedgehog Retrospective, Part 3 (Not viewable in the US.) This sales data number makes Sonic the Hedgehog (16-bit) the best-selling game for the Sega Mega Drive / Sega Genesis console. Shortly after the original release of the game (known as REV00), Sega reissued the game (REV01) with various enhancements, bug-fixes and general tweaks. REV01 added extra layers of scrolling to most parallax backgrounds where many had been flat before, added moving clouds (Green Hill Zone), rippling water (Labyrinth Zone), corrected the level select screen's arrangement, among other minor changes. REV01 is most commonly found on Japanese cartridges, where the game was released slightly later than in Europe and North America, and was also made available in later production runs internationally. A complete list of changes between REV00 and REV01 was compiled by Hivebrain, by disassembling both versions and comparing the resultant code. "clr.l" used instead of "move.l #0" in ClearScreen. "TM" on Sega screen is hidden if the console is Japanese. "TM" on title screen isn't loaded if the console is Japanese. AddPoints gives you an extra life for every 50000 points. Level select stage order is correct. Level select code is UDDDLR (instead of UDLR) if the console is Japanese. Moved restart level flag check in Level_MainLoop. Added background scroll check to LZWaterFeatures. d2 is cleared in a slightly different way in MoveSonicInDemo. Added gamemode check in SS_MainLoop. Blank frame added to rings mappings. Added check in monitor contents item to prevent interruption of drowning music. Lamppost time is cleared after game over (obj39). Minor change to DrownCount (obj0A). Minor change to Labyrinth boss (obj77). Minor changes to Final boss (obj85), including 1000 point bonus for killing it. Ending sequence debug list changed. Some unneeded things removed from Pattern Load Cues. Sega logo graphics and mappings slightly different. MZ & SBZ 256x256 tiles modified. SS5 & SS6 layouts modified. Minor change to SolidObject subroutine. A final modification was made to the original game by Sega for the 2002 compilation Sonic Mega Collection, which revised the spike damage behavior to be like that of later titles. This version is referred to as "JP2" in the game's menu, and is actually REV01 with extra code patched directly onto the ROM file. The success of Sonic the Hedgehog has led to the game being released for numerous systems, and included in most compilations of Mega Drive games. The 2000s also saw the game sold through a number of download services. During the 1990s and early 2000s, modifying Sonic the Hedgehog involved directly editing the ROM file with tools such as hex editors and Tile Layer Pro. Such efforts were somewhat crude by today's standards, and generally only produced straightforward changes to the game's data (graphics, levels etc.). In 2004 the first disassembly was produced, which allowed code and data to be restructured in any conceivable way, and then recompiled into a fully working ROM file. Subsequent years of refinement has produced a completely labelled and commented disassembly, which is hosted on GitHub. Sonic the Hedgehog Story Comic - A three volume comic released in Japan used to advertise the game. Contained in the narrative are elements there were eventually changed or removed from the final product. Sonic the Hedgehog (promotional comic) - A standalone story commissioned by Sega of America using the westernized story no longer considered canon. This page was last edited on 16 March 2019, at 13:02.